Coordinating six voters to compile their lists of the top 60 NHL prospects creates some interesting sets of numbers. The most important number was one, for the spot Tampa Bay Lightning forward Jonathan Drouin claimed, finishing ahead of Anaheim Ducks goaltender John Gibson. 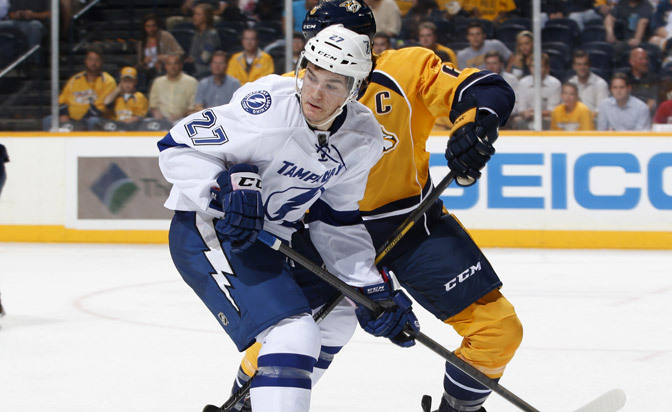 Drouin, a high-scoring forward, was the third pick of the 2013 NHL Draft and the top selection by two voters and second on another ballot. 1 -- Set of brothers on the list: Buffalo Sabres forward Sam Reinhart at No. 4 and New York Islanders defenseman Griffin Reinhart at No. 20. Anaheim Ducks forward Nick Ritchie is No. 35, but older brother Brett Ritchie of the Dallas Stars did receive enough votes to make the list. 4 -- Players to receive at least one first-place vote: Jonathan Drouin (2), John Gibson (2), Evgeny Kuznetsov and Sam Reinhart. 5 -- Players in the top 60 whose fathers played in the NHL: Sam and Griffin Reinhart (Paul Reinhart), William Nylander (Michael Nylander), Max Domi (Tie Domi) and Kasperi Kapanen (Sami Kapanen). 8 -- Players born in Sweden, the most of any European country. In addition, five players who were born in other countries, Andre Burakovsky (Austria), William Nylander (Canada), Jakub Vrana (Czech Republic), Kevin Fiala (Switzerland) and David Pastrnak (Czech Republic) were drafted after playing for teams in Sweden. 12 -- Players to receive at least one top-five vote: Jonathan Drouin (5), John Gibson (4), Evgeny Kuznetsov (4), Teuvo Teravainen (4), Sam Reinhart (3), Aaron Ekblad (3), Andrei Vasilevskiy (2), Leon Draisaitl, Anthony Mantha, Alexander Wennberg, Griffin Reinhart, Jake Allen. 15 -- Players on the list who were drafted out of the Ontario Hockey League, most of any of the three junior leagues in Canada. Eleven came from the Western Hockey League, six from the Quebec Major Junior Hockey League. 17 -- First-round picks from the 2014 NHL Draft. There were 13 from the first round in 2013, 10 from the first round in 2012, two from the first round in 2011 and three from the first round in 2010. Four players were drafted outside the first round and there was one undrafted free agent, Minnesota Wild defenseman Christian Folin. 22 -- Players to receive at least one top-10 vote: Jonathan Drouin (6), John Gibson (6), Evgeny Kuznetsov (5), Sam Reinhart (5), Teuvo Teravainen (5), Sam Bennett (5), Aaron Ekblad (4), Andrei Vasilevskiy (4), Andre Burakovsky (3), Leon Draisaitl (2), Anthony Mantha (2), Alexander Wennberg (2), Griffin Reinhart (2), Nikita Zadorov, Filip Forsberg, William Nylander, Darnell Nurse, Dmitrij Jaskin, Jake Allen, Tanner Pearson, Nick Ritchie, Kevin Fiala. 28 -- NHL teams to have at least one player in the top 60; the Anaheim Ducks and the Washington Capitals had four each, most of any team. The New Jersey Devils and the Colorado Avalanche were the only teams with none. 31 -- The gap between No. 30 Scott Laughton (165 points) and No. 31 Brandon Gormley (134 points), the biggest spread anywhere in the top 60. 38 -- Forwards on the list; that includes 17 centers, 12 left wings and nine right wings. There also were 17 defensemen and five goaltenders. 120 -- Players to receive at least one vote.